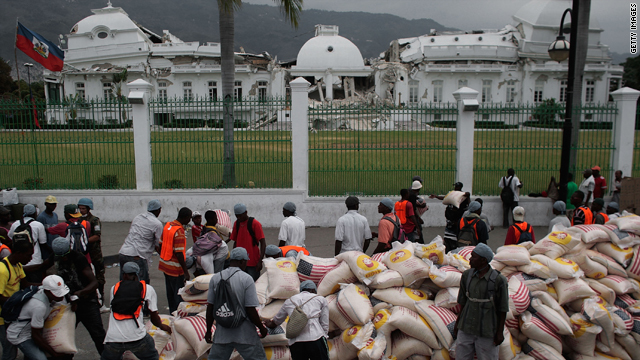 Haitians are given bags of rice in front of the National Palace Monday in central Port-au-Prince, Haiti. Celso Amorim: "We cannot lose sight of the central role of the elected leaders of Haiti"
(CNN) -- The government of earthquake-ravaged Haiti must become more visible now, even amid a global outpouring of aid as the impoverished island nation struggles to recover, Brazil's foreign minister said Monday. "The government, in spite of all the difficulties, should appear more to the people," Brazilian Foreign Minister Celso Amorim said in an interview with CNN's Christiane Amanpour. "I think it's important because after all, they are the ones who transmit the needs of the Haitian people to us, to the international community." Amorim, speaking from an international conference on Haiti in Montreal, Canada, said it's important for the world to follow the priorities of the Haitian government. "We cannot lose sight of the central role of the elected leaders of Haiti," he said. "Haiti is a country that has an elected government." Amorim was among more than a dozen foreign ministers and leaders, including U.S. Secretary of State Hillary Clinton, attending the Montreal conference. Representatives of many international institutions such as the United Nations and the European Union were also there. Speaking in Montreal, Clinton said, "As part of our multilateral efforts to assist Haiti, we should look at how we decentralize economic opportunity and work with the Haitian government and people to support resettlement, which they are doing on their own, as people leave Port-au-Prince and return to the countryside." Haiti's Prime Minister Jean-Max Bellerive was also in Montreal. He said the international aid effort has only just begun. "I can simply tell you that the population is in need of more and more and more to confront the massive task of reconstruction," Bellerive said. The aim of the Montreal meeting is to develop a strategy for early recovery and longer-term reconstruction. Once the strategy is set, a donors' conference to secure funding for Haiti would take place. Amorim told Amanpour he expected the donors' conference is likely to take place at the end of March, possibly in New York, though that was not confirmed at the time of the interview. "We cannot endure, we cannot see a disaster of the size of Haiti, with the poverty that exists in Haiti, and not do anything," he added. "If you don't act for development, for emergency now and development immediately, you'll be having an enormous security problem." Amorim told Amanpour that as part of his country's efforts to bolster security in Haiti, the Brazilian Congress Monday approved a plan to almost double the number of Brazilian troops in the U.N. force in Haiti, to as many as 2,600 soldiers. The U.N. force there, known as MINUSTAH, has been led by a Brazilian general since 2004. It lost dozens of its civilian headquarters staff during the earthquake. Amorim, who has just been to Haiti, said it was also vital to rebuild the country's national symbols. "I think this is very important so that the Haitian people feel also not only that they are receiving food and water, but also they are recovering their self-esteem," he said.